New built flat with private own entrance. Idea stay for family and group visitors. 3 roof windows with Starwar blackout blinds; 360mb broadband, 4k Smart TV with Netflix; HD cable Channels; wash-dryer; instant hot shower; modern kitchen. Baby cot available on request. Plenty parking space and huge park 200 meters away with various amusements. This is a spacious new built detached flat with private access. Everything in the house is brand new. Kitchen area is equipped with electric cooker, fan, oven, microwave, wash-dryer, fridge, sink and a dinner table. Toilet/shower room has 24/7 instant hot water shower. There is a king size sofa-bed in the living room, facing a 4k smart TV. 50+ TV and 17 HD channels. Netflix is also on your fingertips. In bedroom, you have a king size bed with orthopedics mattress and under bed storage, a 1.5m X 2m wardrobe with mirror, a computer desk and a rocking chair. WIFI and either net sockets available in both living room and bedroom. The broadband tops 360mb, fastest in Ireland. You will have full access to the apartment; the backyard around apartment is shared with my house. The apartment itself is located at the back of my house. There is a private entrance to the apartment. Keys will be provide on your arrival for the private entrance and flats. We will try our best to greet you on your arrival. The apartment is for group/family/couples and we are striving to accommodate you with privacy and comfort. We are living next door, and available through text, email, phone, Airbnb app. We have a 7 years old Labrador in the house. He is a very quite house pet and stay in house all the time, he does not access the garden. St Anne's is a quite and mature estate. The place is 170 meters away to St Anne's Park, which features a rose garden, a pitch and put golf course, tennis court, basketball court, playground, dog park and a Chinese garden. North Bull Island National Nature Reserve is on the other side of St Anne's park, idea for wild life, bird watching or a long walk. A convenient shop, a barber shop, and an Indian take away is around the corner about 270m away. Raheny junction is 700m away on Howth Road, with a local super market(Super Value), pharmacies, butcher, flower shop, dry cleaner, banks, gym and number of restaurants. Mulino is around the corner, it is a very nice local Italian restaurant. Mint Cottage has very nice curry. 15 mins drive. If you are not driving I recommend using taxi, cost is around 25 euro from airport. 15 mins drive from Airport car rentals. If you are not driving I recommend using taxi/hailo app/mytaxi app; Please let me know your flight number and number of visitors, number of bags. If you wish to use public transport, you can take any bus to city center, then use Bus 29A to Raheny. If you take 29A, city center(Abbey street) is the last stop. Move buses available in Raheny junction. Airport is a 15 mins drive. You can buy Leap card from vendor machines at Raheny Dart Station, it accepts cash and credit cards. Leap cards can be topped up at same machine. You will be charged max cost when you scan the leap card to enter any Dart Station, and refunded the over-charge when you scan the card again to exit any Dart Station. Leap card can't be shared. Leap card can also be used on bus, you will have to tell the bus driver where you are going. If you are not sure when to get off, you can always ask the bus driver to remind you. He/she will use the speaker to remind when you need to get off. Leap card can be shared for bus. Leap card can also be used for LUAS(tram), same way you use it for Dart, can't be shared. There is a taxi rank at Raheny junction, or you can always use Uber or Hailo(irish uber). Cost around 15 euro to go to city center depends on number of passengers and time of the day. We enjoy travel with comfort, good food, and long walk with our dog. As hosts, we strive to accommodate you with comfort and privacy. This is a entire flat with private entrance, equipped with all modern appliances and entertainment. A separate garage provides a power tower, an exercise bike and a cross trainer. It's built in 2016 and located in a very mature, quiet and safe neighborhood. The location is close enough to city center and enjoys plenty public transport options. It's also next to one of the biggest park in Dublin, and close to the sea. Pet allowed and family friendly. Provide all necessary essentials and entertainment. Modern appliances like 4k Smart TV, Netflix, HD cable channels, etc. Quiet and safe neighborhood. Fastest broadband in Ireland and all modern entertainment(4k smart TV, HD cable channels, Netflix). Public transport: DART(on ground sub-way), bus 200 m away. Convenient location for driving, close to motor way, city center and airport. 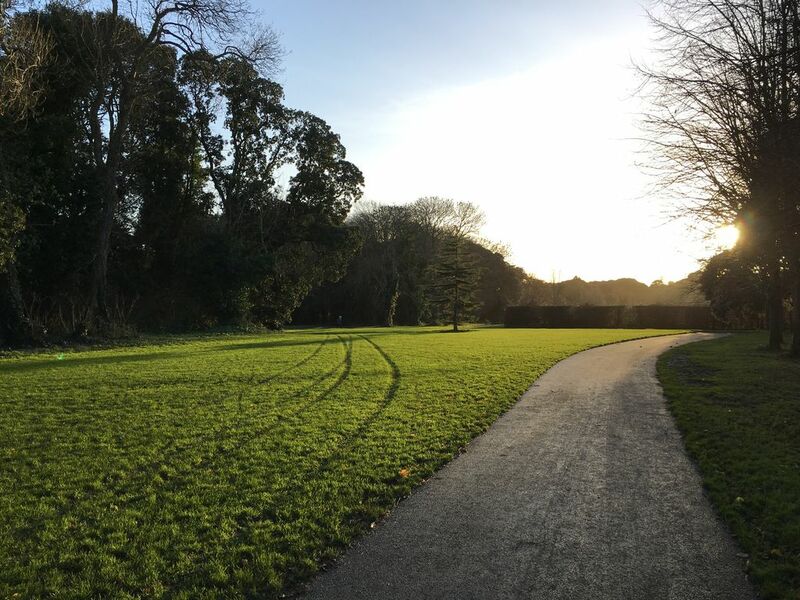 120m away from one of the best family friendly park in Dublin, the park is huge! well insulated, 4 electric heating, strong and instant. There is a garage, but it's used for storage and gym equipment, not suitable for parking. 2 sun roof window, sofa, coffee table, smart TV with Netflix, what else do you need! The apartment had everything we needed, including a cot for our toddler which was very helpful and much appreciated. It's in a great location right next to the 29A bus stop so easy to get into town and walking distance to grocery stores and St. Anne's Park. Hosts were very responsive and helpful. Will definitely look at staying here again if possible next time we're back in Ireland. Thank you so much for letting us stay in your beautiful little place. Thanks for the refreshments upon arrival, it was a very lovely touch. We felt at home for the past 6 weeks. It was very comfortable warm and cosy even in the middle of winter. We will remember our stay here close to our family in Raheny. Also thanks for letting our little kitty wander around the garden as well! Although I was unexpectedly able to go, my friends stated that they enjoyed the house! Hangsu was very attentive and communicative, which was so wonderful. Affordable and secure vacation getaway for family. Affordable and secure vacation getaway for family. The owner of the property maintain constant contact with us with questions regarding amenities at the property and how to get around Dublin from the apartment we had for four days. There is a manual that accompanies the home which he will send to you so you have a good idea on how to operate all appliances, shower , Doors, Internet, TV, and anything else to make your stay pleasurable. The owner greeted us upon arrival although we got in very late one evening and explained everything to us with ease. Using public transportation from the location was easy to figure out in the neighborhood is very close and convenient to shopping for food or small restaurants. Very convenient and clean. Outside of property needs paint, but other than that, it was great. This little place has everything for your stay. Its so cozy, cute, clean, and quiet. The owner was so very responsive and accomodating. I would definitely stay again.